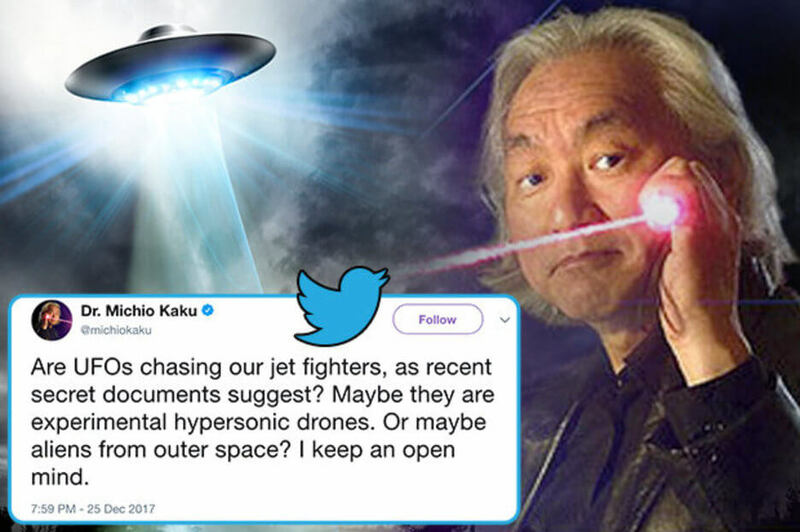 Dr Michio Kaku – America’s answer to Stephen Hawking – has said a bizarre object US military personnel reported seeing pursuing some of their warplanes could be a new type of super-fast aircraft.But the well-known physicist has also not ruled out the possibility the strange object flying near American military planes could be extraterrestrials. It recently emerged the Pentagon has been secretly running a multi-million pound program investigating UFOs for years. Video has also been leaked showing two US pilots checking on strange aircraft in the Pacific Ocean around 100 miles from San Diego, which first appeared at 80,000ft. Mysteriously, it hurtled towards the sea before stopping at 20,000ft and then disappearing.On Twitter today, Dr Kaku, a world renowned physicist, gave his theory on the bizarre encounter and Pentagon research. He said: “Are UFOs chasing our jet fighters, as recent secret documents suggest? Just what is this strange, menacing-looking cloud that is terrorising the residents of a Brazilian town? Both Russia and China are developing hypersonic aircraft – which are capable of flying more than five times the speed of sound.China has been sending drones to the edge of space last year and has been experimenting with hypersonic technology. Ballistic missiles called “hypersonic glide vehicles”, or HGVs, which are capable of striking anywhere in the US in less than an hour are being developed by the People’s Liberation Army (PLA). They can deliver nuclear payloads a ultra high speeds within a matter of minutes, leaving defence systems helpless. Russia has claimed its 16,000mph hypersonic nuke missiles could be ready for operation in two years. In response, it has claimed the US is developing hypersonic weapons which travel at five times the speed of sound and destroy targets with a “kinetic energy” warhead.Meanwhile ex-US Navy pilot commander David Fravor, who was in one of the two fighter jets chasing the UFO in 2004, warned that world leaders should take the threat of aliens seriously. He has thrown his support behind former Pentagon official Luis Elizondo who led the top-secret £16 million Advanced Aviation Threat Identification program. Speaking about his encounter Mr Fravour said: “It was a clear day with a blue background and it was perfectly white. “We didn’t see any windows, no form of propulsion, nothing, just a big white object.